American Wolf: The Top 5 Most Bizarre Moments of the 2012 Campaign. The Top 5 Most Bizarre Moments of the 2012 Campaign. It's only been 10 days, but the 2012 election already feels like eons ago. The perhaps-likely win for Obama has become now-obvious, while Romney's disappearance from the mainstream Republican dialogue has been carried out with a velocity that is almost staggering. But even as the surreal settles into the ordinary, the campaign still comes back to me in bits like a deep, long dream that stalks waking life. Like a dream, it was very weird — far more so than any other election I can remember. Perhaps this could only be expected from the setup. On one side, you had Barack Obama, champion of all things hope & change, now trying to show that the hope had begun to deliver & that we could not risk change right now, despite the nation's economic woes. On the other side, you had Mitt Romney, a big-business Wall Street tycoon who was the exact person who was vilified in the financial crisis in the first place. Throw into the mix that Romney's signature achievement as governor, Massachusetts' universal healthcare, was the direct template for Obama's signature achievement as president, national universal healthcare, which put Romney in the position of arguing against his own achievement while Obama praised it, & you have a very strange predicament indeed. Ever since MTV first reared its beautiful, frenetically-edited head, the news story has been morphing into the soundbite. This election took things one step further, turning the soundbite into a phrase that "summarized" (more like overshadowed) the 90 minutes of debating. 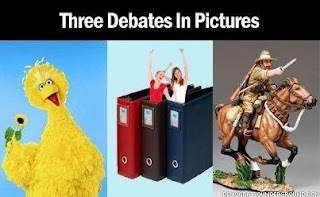 The first, "Big Bird," was supposed to show Romney's small-government credentials but instead found him being sensationalistic (the average American pays $1.35 a year for PBS) & out-of-touch (Elmo is the new Big Bird!). The second, "Binders Full of Women," was supposed to be a passing phrase in a clearly-rehearsed story to prove Romney's cred with women, but instead stuck out like a sore thumb & succinctly summarized everything that made Romney oblivious to the very social issues he was trying to master. The third, "Bayonets & Horses" was the only pre-planned "zinger" that landed in the debates, & was Obama's sole debate catchphrase, used to show the anachronism that was Romney's vision of national defense. & with this, the evolution was complete. Soundbite, meet bit-bite. 4. Romney Proves Unqualified To Be a UK Tourist. It shoulda been the most open-&-shut foreign policy trip either. Mitt Romney, savior of the 2004 Olympics (an accomplishment even most Democrats gave him), was going to visit the London 2012 Olympics, held in our strongest international ally & led by fellow conservative David Cameron. Instead, Romney gave an interview on the eve of the trip expressing "disconcerting" efforts made by England that implied a lack of preparation. The result was the worst American tour of England since Jerry Lee Lewis. Romney struggled to find his footing regarding the Olympics, called diplomats by the wrong title, & told the press about meetings that were supposed to be confidential. As the gaffes followed him to his scheduled stops of Israel & Poland, so too did the always-perfect tag from the Twitterverse used to document them: #Romneyshambles. 3. Obama Sleepwalks Through the First Debate. A perfect storm of careless statements, international stupidity, & staffing blunders had taken hold of Romney's campaign by the time he walked onstage to meet the president in the first debate. Pundits on both sides agreed that if Obama could "win" the first debate, the election would be all but over for Romney. Instead, Obama choked. What everyone forgot was that Obama was never a great debater — Hillary won most of their primary square-offs in 2008 — & Romney had sharpened his skills in the two dozen or so Republican primary debates. With the assist of non-moderator Lehrer, Romney was able to bully & bluff his way through, keeping an upper-hand on the conversation in a strange mix of curt rudeness & blatant lies. For me, though, the most head-shaking-at-a-trainwreck moments for Obama came at the beginning & end: First, when he opened with a maudlin 20th Anniversary message to his wife & began his closing remarks by saying, "Four years ago, I said I am not a perfect man & I would not be a perfect president." WHAT?! Or, he coulda added, a perfect debater. 2. Romney Rejects 47% of All Americans. There have been blunders & there have been blunders, but there has never been anything quite like Romney's infamous "47%" comment. Secretly filmed at a closed-door campaign fundraiser, the video leaked just prior to the first debate & threatened to take his entire campaign off-course. In it, he derided 47% of the population to be victims "who are dependent on the government" & believe the government has to care for them in an act of willful laziness. These are the "people who will vote for the president no matter what," Romney explained, failing to realize that the states with the largest-amount of government aid programs are in solid-Red states like Alabama & Mississippi. But what happened next made things even weirder. Forced to answer to the video, Romney held an awkward press conference in which he granted that his words were inartfully stated, but essentially true. So the man looking to lead the country secretly writes off almost half of its population & then publicly stands by this assessment. Romney didn't plan to reverse this until the first debate, when much to his shock (& everybody else's) Obama did not bring it up. It's too bad he didn't because, based on the tepid explanation Romney gave to Fox News later that night, it woulda landed a much-needed point in the president's favor. 1. Clint Eastwood Talks to an Empty Chair. National icon Clint Eastwood gives a high-profile endorsement of Romney & is invited to speak at the Republican National Convention after making a great impromptu speech for Romney on tour. What could go wrong? Well, Eastwood could request a chair. & the rest is...history? Said Eastwood later: "If somebody's dumb enough to ask me to go to a political convention & say something, they're gonna have to take what they get." & after watching some 12 minutes of his unscripted surrealism, this may just be the only 100% true statement to come out of the 2012 campaign.